BOSTON – Frank “Cadillac” Salemme, a former boss of the New England Family of La Cosa Nostra (NELCN), was arrested today and charged with murder of a witness. 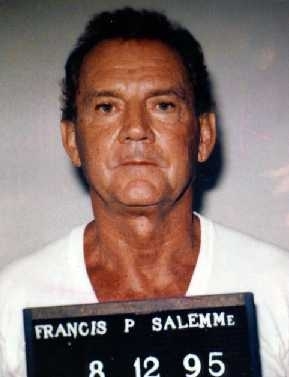 Francis P. Salemme, 82, was arrested this morning in Connecticut and is scheduled to appear in U.S. District Court in Boston today at 3:00 p.m. In the early 1990s, Salemme was the “boss” of the New England La Cosa Nostra until he was indicted on racketeering charges in 1995 and convicted in 1999. He was subsequently convicted of obstruction of justice in 2008 for lying to federal authorities about the murder of Steven A. DiSarro. The charge of murder of a federal witness provides for a sentence of death or life in prison, five years of supervised release and a fine of $250,000. Actual sentences for federal crimes are typically less than the maximum penalties. Sentences are imposed by a federal district court judge based upon the U.S. Sentencing Guidelines and other statutory factors. United States Attorney Carmen M. Ortiz for the District of Massachusetts; United States Attorney Peter F. Neronha for the District of Rhode Island; Harold H. Shaw, Special Agent in Charge of the Federal Bureau of Investigation, Boston Field Division; U.S. Marshal John Gibbons of the U.S. Marshals Service; Colonel Richard D. McKeon, Superintendent of the Massachusetts State Police; and Colonel Steven G. O’Donnell, Superintendent of the Rhode Island State Police made the announcement today. Assistance was provided by the Norfolk County District Attorney’s Office. The case is being prosecuted by Assistant U.S. Attorney Fred M. Wyshak, Jr., Chief of Ortiz’s Public Corruption Unit and Assistant U.S. Attorney William Ferland of Neronha’s Office. The details contained in the criminal complaint are allegations. The defendant is presumed innocent unless and until proven guilty beyond a reasonable doubt in a court of law.